Winter gardens, believe it or not, are achievable if you do your homework and set yourself up properly! Obviously growing vegetables in a colder climate requires a different approach than starting your vegetables in the spring, but it can be done. The rewards to growing over the colder months really need not be explained, as any walk down the produce aisle during winter should give you the answer. There are many tangible benefits you will find from growing winter vegetable gardens beyond basic availability. Produce that comes fresh from the garden will not only taste better, but they will also be much higher in vitamins than produce that was grown elsewhere and has to be shipped to the store. The quality of the vegetables will also be better as a large number of vegetables will store more sugars if they are grown in colder temperatures. You will also notice during the winter time, some vegetables just are not available in the produce section, because they do not store and ship very well. 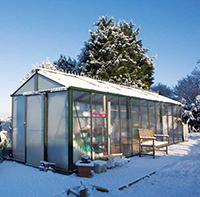 Another incentive to grow your own winter gardens is to avoid commercial chemicals and pesticides. In the end however, you have to enjoy doing it. Gardening is as much a hobby as it is for practical purposes, so always chooses a project that you will love doing. Avoiding Mold and Rotting: For many locations, winters are very damp, soggy months, and you will need to take this into consideration when starting winter gardens. There are several ways you can combat all that winter moisture and make sure your vegetables grow strong and healthy. The first option is to build raised planting beds. The raised beds will allow for much needed drainage during the wet months. Depending on how you decide to build your beds, raised beds can get somewhat elaborate. Most are box frames made of wood that are 6 inches to 12 inches deep, with walkways in between to make management of the beds easy. 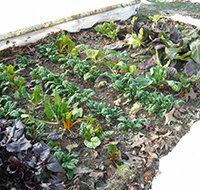 One easy technique for building a raised bed for your winter vegetable gardens is to skip the frames altogether. You can till the entire garden area first, and then use stakes and string to mark off your planting areas and walkways, then grab a shovel and move some of the dirt from the pathways into the beds. Take a rake and smooth out the beds and you’ve effectively created simple raised beds. As long as you never walk on them and compact the soil, they will last you for several years! 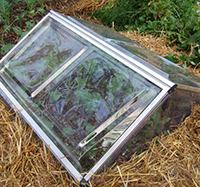 Another option is to build cloches for your plants. Cloches are those little plastic tents you see in some gardens during the colder months. Not only does the plastic keep the rain off of your winter vegetable gardens, but it also traps heat from the sun, making the underlying soil temperature a little higher than it would be outside. These are very easy to make and you can pull it off with simple supplies available at any hardware store. You can use 1/2" PVC pipe, with the ends cut at angles to form stakes. Bend the PVC into a U-shape of whatever size you need, and push the sharp ends into the ground, forming support hoops. Then drape a sheet of heavy clear plastic over the hoops and put weights on the ends to hold it down. There are also manufacturers that produce cloche clips just for this purpose. In effect you are creating a mini greenhouse. When you are finished, make sure one end of the cloche is always open for fresh air so that your winter gardens don’t develop mold and fungus. 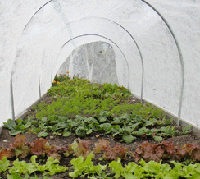 A third option, if you need something bigger than a cloche, would be to build a PVC hoop house. These are more or less cloches built on a much larger scale, mimicking the domed greenhouses you would find at most nurseries. There are countless plans available on the internet for PVC hoop houses or greenhouses, but the basic construction is simple. Use 3/4" or 1” PVC, with T connectors for the ribs, and drive stakes into the ground, leaving 12 inches or so above ground. Bend the PVC into a giant U, with each open end going down over a stake. Then just as with the cloche, cover the entire frame with thick clear plastic. 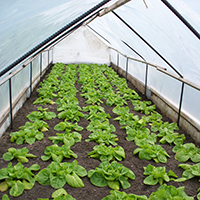 A hoop house is a much better option for winter gardens if you would like to work inside out of the weather, and the genius behind this design is it is very portable and can be easily torn down and set back up each year as needed. Winter Vegetables: The following is a list of vegetables that you should have good luck growing over the colder months, along with the approximate temperatures that they are usually hardy to. Again I reiterate APPROXIMATE! This is merely intended as a guideline to help get you started on your winter vegetable gardens. As with anything, experience is the best teacher and you will learn what works best in your area through trial and error. Starting winter vegetable gardens can be an enjoyable and rewarding experience, and won’t your friends and neighbors be jealous when you show them all the fresh produce you’ve grown and harvested in the middle of winter!